The authority, Indian Air Force has released the official notification regarding the Indian Air Force Rally Recruitment 2019. The declares recruitment is for the Airman (Group Y) (Unmarried Male Candidates). This is a great chance for all those who want to go to the mighty Indian Air Force. Of course, the department gives you a career full of thrill and adrenaline rush. The Indian Air Force Rally Examination 2019 will be conducted between 17 to 22 February 2019. 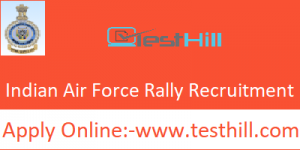 All the information regarding the Indian Air Force Rally Recruitment 2019 is available on the official website i.e. www.airmenselection.cdac.in. Aspirants are suggested to visit there is check all the essential information regarding the declared recruitment. Because the authority is very strict in terms of all the required criteria. All the candidates have to follow all the requirement set by the department. Details of the pay scale or physical requirement are available on the official website. Also, we are providing all the essential information regarding the Indian Air Force Rally Recruitment 2019 on this webpage. Indian Air Force Rally Recruitment 2019 important links are available on the above table. It is a great opportunity for those who are waiting for the Indian Air Force Recruitment for a long time as it is a great platform to all those thrill seekers wanting for an opportunity to be a part of the mighty department. It is a fabulous chance to make their career under the Indian Air Force roof. Candidates can check the relevant vacancies from the Indian Air Force Rally Official Notification. Candidates have to read the whole notification to know about Indian Air Force Rally Recruitment 2019. This will definitely be very helpful to all of you.